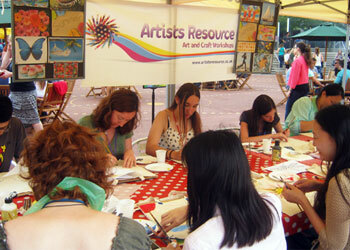 Creative Art Team Building Activities for Teacher Training INSET days and Corporate Employees ‘Away Days’. Leona offers Team building Workshops: “The Importance of Creativity” and “How to Unlock your Creative potential” based in London and the home counties. You can choose between a morning, a full day or 2 days team building activity. For morning sessions the team will create a group Artwork and in full day workshops as well as the group Artwork, individuals also get to discover new aspects of themselves and how they can contribute further and add more value to their workplace. Leona begins by introducing the theme to the group and provides interactive exercises to engage the participants. The Art Project is outlined and the design process instigated. 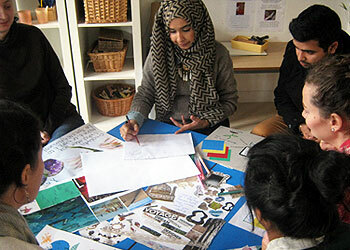 Through the design process Leona guides the group in developing their ideas. Leona teaches how to solve issues with a creative approach that can have unlimited benefits for both the individual, the team and the workplace as a whole. Depending on your desired time scale you can choose between a 2D Artwork or a 3D Artwork for the group to make and to be displayed either indoors or outdoors as a result of your collaborative activity. Leona prides herself on giving quality Team Building workshops that are a catalyst for development and change, focusing on the importance of creativity via a creative approach to life and work. B. Myslinska. 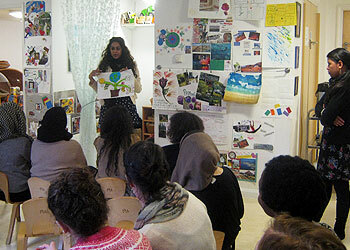 Nursery Manager, Team Building Workshop, East London. “It was great working with you last week. Thank you so much for all your hard work, it was very evident and our guests loved your sessions”. Vicky. Events Manager from Enjoy-Work. West London.